The bubble has officially broken in Event #1, Flight A ($600 NLH Multi-Flight). 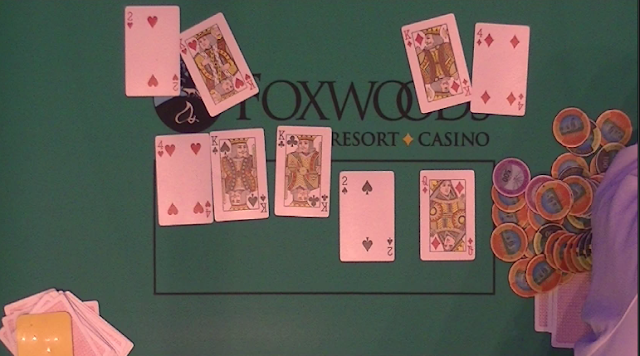 Mike W, the chip leader turned the nuts holding [jc][10c] on a [7h][9s][qh][8s] board against his opponent's set of queens. A third player also folded a set of sevens on the turn. The [4h] river did not improve his opponent's hand, and he is sent to the rail, with the remaining 41 players making the money and making Day 2. Players in both events are now hand for hand. Event #1A will play to 41 players before bagging and tagging for a night. Event #2 is currently on the money bubble, with 12 players being paid. Players are now on a 60 minute dinner break. They will return to play level 14 (1,000/2,000 blinds with a 300 ante). There are currently 84 of the original 335 players remaining in this first of three flights. According to players at the feature table, a big hand just played out resulting in the elimination of Ryan Mostafa. Mostafa raised pre-flop and got a few callers, including Mike W. on the button. The flop came [kc][ks][4h]. After a betting war between Mostafa and Mike, they were the only two players heading to the turn. When the turn came the [2s], the players got it all in. Mike W. had flopped a boat holding [kd][4d], and Mostafa had turned a boat holding [kh][2h]. The [qd] river did not change the outcome, and after a close count of chips, it's determined that Mostafa is eliminated from play. Mike W. is now sitting with 230,000 in chips, and is the current chip leader of this flight. Registration for this first of three flights is now closed. There were a total of 335 runners. All Day 1 flights will play down to approximately 12% of the field, and all players making it to Day 2 (Tues. March 15th at noon) will be in the money. Players are now on their second 15 minute break of the day. Dealers will be racing off the 25 chips during this time. Any player wishing to enter/re-enter into this first of three flights, has until the end of this break to do so. On a board reading [qd][7h][6d][4s][2s], a player in early position bets 10,000 into a pot of nearly 18,000, and Ralph Macri goes into the tank. After two minutes of thinking, Macri cuts out the two 5,000 chips, lifts them high above the table, and drops them down onto the felt, signifying a call. "You're good Ralph," his opponent says, "Your queen's good." Macri shows [qh][10d], and his opponent mucks his hand. Macri is now sitting with 85,000 in chips. 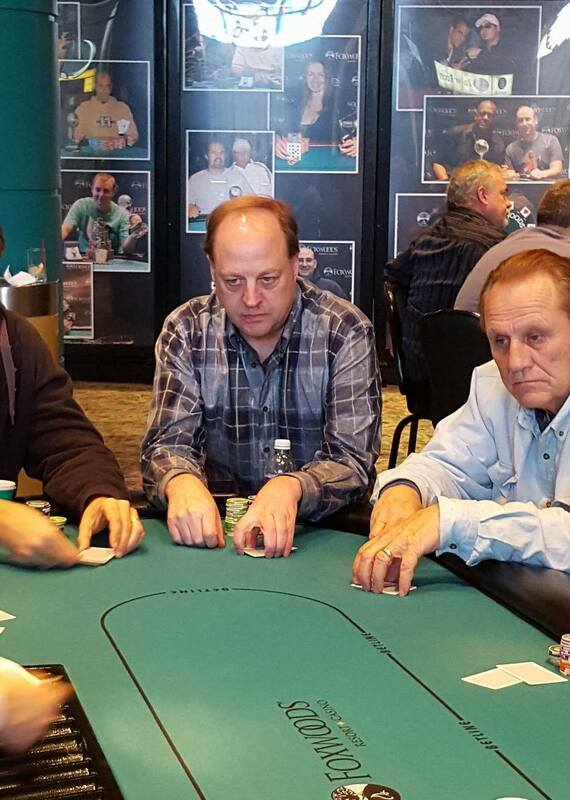 There were a total of 102 entries in today's $300 Omaha Hi/Lo 8+ Event. Rohan Long shoves all in from middle position, and the player on the button asks for a count. Upon hearing the total of 2,950, the player calls and both blinds fold. "I just want Wesley (the dealer) to bust me before he gets moved to a new table," Long says as he turns over [3d][3s]. The button shows [ah][4s]. The flop comes [6s][6d][3c], giving Long a full house. The [6h] comes on the turn, and Long calls out, "Ace, ace, ace," seemingly really wanting to be eliminated. But it's the [3h] on the river, giving Long quad threes. On a board reading [8d][5h][3d], a player in the small blind bets 100. The players under the gun and in the hijack both call. Joe Heinzmann raises to 200 on the button, and all three players call. When the turn comes the [9d]. It checks around to Heinzmann who bets 200. Only the player in the small blind calls. When the river comes the [qc], the small blind checks, and Heinzmann bets 200, and his opponent calls. "Flush, nut low," Heinzmann says as he turns over [ac][2d][4d][4h]. The small blind looks at his cards, and mucks them face down. 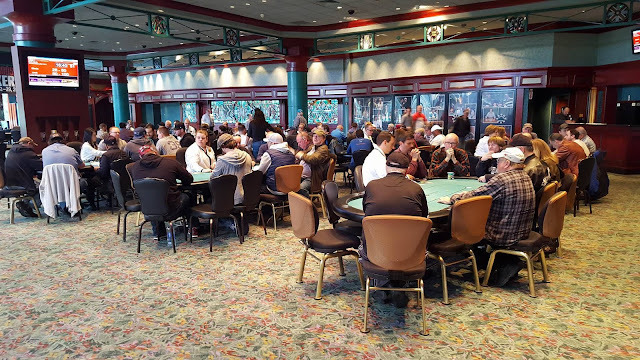 The $300 Omaha Hi/Lo 8+ Event has just begun. Anyone wishing to enter this event has until the start of Level 5 to do so. Players start with 10,000 in tournament chips, and play 30 minute levels. Event #1, Flight A is now underway. For those wishing to tune in to the live action, we are streaming a feature table at www.foxwoodslive.com.